Having served up a veritable banquet of fixtures for you this afternoon, we've got a treat that will go very nicely with your Sunday roast tomorrow afternoon in the shape of Exeter v Leicester. The new guard, with genuine title aspirations, up against the old guard, who are synonymous with titles both home and abroad. Exeter v Leicester, commentary on BBC Radio Devon and BBC Radio Leicester, and of course live text commentary and match report from BBC Sport tomorrow - kick-off in that one is 15:00 GMT. Why not join us? Until then, thanks and good evening. Well Northampton's win against leaders Saracens lifts the Saints up to fourth, and keeps the champions within Exeter's grasp. Wasps stay third, just two points above the Saints, while Sale and Gloucester wins give them genuine hope of a top four finish in a tight middle third. Quins' losing bonus point also keeps them in the mix. Bath ease their fears with a win against a London Irish side whose plight looks tough. Matt Banahan set up Bath's win with two first-half tries, leaving London Irish eight points from safety at the bottom of the table ahead of their 'home' game in New Jersey against Saracens next week. Alex Lewington's late try put London Irish within the width of the woodwork from earning a losing bonus point. But it wasn't to be. Saracens saw their last chance to gain something from this game evaporate when Nils Mordt smashed the ball into touch with seconds to play. Northampton battled away to get the points and they keep the battle at the top of the Premiership alive, notably with Exeter and Leicester in action tomorrow. 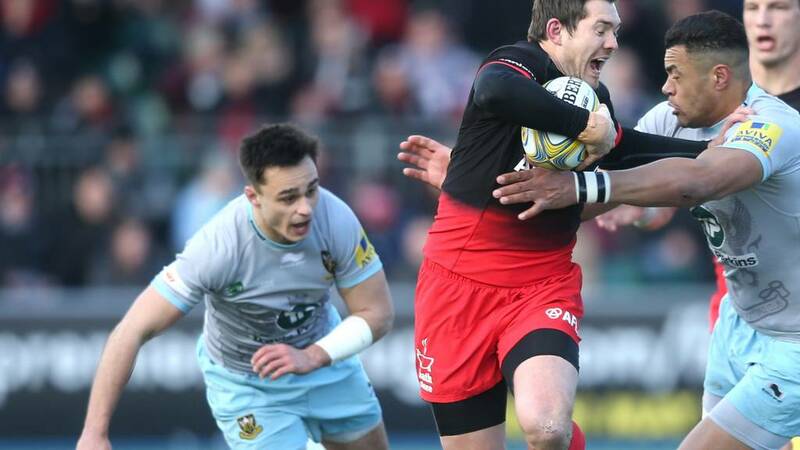 Not a classic, but an important win for Saints, Sarries need to rediscover their early form. Staggering finish from London Irish. They build their best attacking threat and show great composure for Alex Lewington to cross. It was an audacious bid by the visitors to try earn a losing bonus point. Greig Tonks landed a late penalty on his London Irish debut, and from the restart Lewington went in. However, the conversion from way out wide hits the post. London Irish finish with nothing. Five to go. Jacques Burger goes jackalling at the ruck and the penalty goes Northampton's way after he loses his feet. Stephen Myler slots it effortlessly. Five-point gap at the death. Into the last three minutes and London Irish are trying to orchestrate a late consolation try. They are deep in Bath territory, but more it left or right they cannot get through. Result, come up with possession. Pressure released too easily there. Eight and half to go. Alex Goode slams a kick between the uprights and we're back to two points. It's that grindingly anxious a game that I've got a headache. The wind hasn't helped but it's not a fluid game at the moment. Scrappy and disjointed. Even if Northampton do come up with the points here at Allianz Park, one aspect that might temper their excitement is the injury suffered by Courtney Lawes who limped away from the game. Looked to have hurt his ankle in a tackle, and both England boss Eddie Jones and Jim Mallinder will be nervously awaiting scans to assess the extent of the injury. Wasps' Jimmy Gopperth misses with a last-ditch drop-goal attempt but there's the final whistle. Gloucester record their first victory over Wasps since September 2012 and the visitors fall to only their second defeat on the road this season. A vital win for the Cherry and Whites over an out-of-sorts Wasps side who created very little all game. Just 10 minutes remain at the Rec. Bath closing in on a bonus-point win and really not letting up on a London Irish side that are showing signs of being deflated by how little they have got out of this game. A lot of effort and, as the story has been all season, very little reward. They need a converted try and some more to earn a losing bonus point, at the very least. The second half has been a bit flat. Far too many turnovers and neither side seem to be able to close this game out. But two minutes left to play here as Wasps have a scrum on their own 10-metre line. With Bath closing in on just their second win in 10 games, the experience is a little much for some to handle. And Leroy Houston's finish was not even a spectacular one! Well Sarries were pinged at the scrum for popping up and out, so Stephen Myler slots the penalty goal to nudge Saints further ahead. If anything summed up the state of this game at the moment, then it's a scrum that has taken three minutes plus. THREE MINUTES?! Just sort it man. Sorry. Greig Laidlaw misses his second penalty of the day and Gloucester's lead stays at three points. But the Cherry and Whites are persistent and have the ball back in Wasps half. Matt Kvescic with another huge carry, can they find a way through? You can feel the nerves at Kingsholm as Gloucester are clinging onto a three-point lead over the in-form Wasps. 10 minutes to go here as an intricate move by the visitors goes astray and the home side will attack from the half-way line. Callum Brady dinks the ball in behind but it popped up nicely for Rob Miller and Gloucester will have an attacking line-out. Well we're not even up to the hour mark yet. There's not a lot of rhythm to the game at the moment, it's awkward, stop-start. Both these sides have fluency to their game, but they're not showing it currently. I'd like to see the unforced errors stats for this one, I'm predicting not good reading. That is the try-scoring bonus point in the bag for Bath. Leroy Houston with a simple finish, with London Irish's defence scattered by a some superb build-up play from the hosts. It comes at the end of sustained pressure, Matt Banahan with the initial break and Kyle Eastmond makes the final pass.